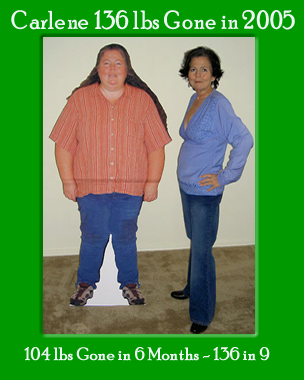 Carlene’s Perfect Diet for the Obese – It’s the One She Used! Now that’s quite the claim, isn’t it? The perfect diet for the obese! Yup, it is, and although Carlene isn’t the only one to claim such a thing, we do have over 12 years of experience seeing it in action. I am talking about our Rawk Starz diet. While our other diets work great for the obese, the Rawk Starz diet gives startling results fast and it improves health immensely. But why? Why do 1200 calories of our Rawk Starz diet give so much faster weight loss than say our Wholy Rawkers diet with the same amount of calories? I am a professional nothing! Keep in mind, I am not a doctor, specialist, or even researcher. I’m just a woman who found her miracle and then shared it with others for 12+ years guiding hundreds of obese women to the same results. So, it’s Carlene’s data that we are going on. After all these years and why I believe this is the perfect diet for the obese is from observations of the women I have worked with. Most obese women come to camp with some form of PCOS. Most obese women come to camp borderline if not full-blown diabetics. What do these two things have in common? Insulin resistance. In fact, many were given that diagnosis along with a myriad of others. If Insulin Resistance keeps us from losing weight, then this diet seems to circumvent this. Yet, we eat a ton of fruit. Enough to give our diabetic’s doctors heart attacks. But, we only eat low glycemic fruit. We do not spike our blood sugar or live on high glucose. Our sugars are balanced and even for the diabetic, add some greens or seeds with that fruit and you’re good to go. So if we aren’t calling on our pancreas to do so much work and to produce so much excess insulin, maybe we aren’t blocking our body from metabolizing correctly. Here’s an article written for young women’s health that basically says what we discovered ten years ago when my granddaughter was conceived naturally after a year eating a half Rawk Starz diet. Those who eat bananas and sweet grapes do not get the same speed of loss as those who don’t. We also live low fat, and while the verdict is still out on fats and sugar levels, for me personally, someone who tracked her sugars for years after her dad died of diabetes, I found that if I ate high fat (cashews) my blood sugar was higher. So, besides fast weight loss, where’s my proof? I have to say it’s in the form of babies and the lowering of insulin and metformin prescribed by doctors. Babies! Yup, we’ve had our fair share of women who came to camp unable to get pregnant and left because they had conceived. My own two granddaughters are part of the RFBC baby boom. Diabetic women have returned from shocked doctors with words of encouragement to keep doing our program. Now is this true for everyone? No, of course not. Naturally thin women don’t see the same fast loss after the water weight is gone as obese women do. Again, that could be because they aren’t insulin resistant. Yet, those with PCOS seem to have similar results as the obese women. Women who don’t give the diet a true try don’t have the same results, but for the committed obese woman, it’s pretty much a given. Our Rawk Starz diet is the perfect diet for the obese. But it’s not an easy diet, so many may want to take the title of perfect diet for the obese away from us. Actually, for me, it was an easy diet, and for many of the women you saw on our front page who won our 100 lb challenge, it was for them too. Why, because it’s a no fuss, no mess, grab and go kind of diet. For me, it was more because it allowed me to break free of thinking about food. I put my focus on life instead of food. Now for the obese being able to do that is a godsend! The other thing our diet does for the obese is it helps clean the liver. All that fruit is cleansing. And a clean liver, the organ that supplies all those non-essential amino acids and regulates hormones, makes for a healthy body. But this change occurs slowly and those benefits don’t show until after 4-6 months eating clean. Many after the 4 to 6 month mark notice changes in the severity of menses, some, unfortunately, get their periods back where they had disappeared so they may argue the perfect diet for the obese title as well! But, I will argue back, a balanced body is a healthy body. Can every obese woman do this diet? No. I’m afraid many will not follow it through all the way. Why because unless you are willing to do all the other work to break food habits, addictions, and obsession, you will grow tired of always being diligent and as unbelievable as it sounds, decide eating the foods that made you obese is more important than ridding yourself of the fat suit. In truth, success is a formula. 2 parts Carlene’s Perfect Diet for the Obese, 1 part Commitment, 1 part Determination, 1 part Walking, and 5 parts dedication to change which is what we work on every day at Raw Food Boot Camp. Why? Well, as Frec’s mom said so many years ago. Weight loss is easy, it’s keeping it off that’s hard.